That’s where these apple and oat muffins (which just happen to be gluten-free) come in. Inspired by Bircher muesli, these protein-packed muffins get extra texture and flavor from almonds, grated raw apples, and oats folded into the gluten- and dairy-free batter. Spiced with just enough cinnamon and sweetened with maple syrup, they’re the breakfast treat of the season. Fun fact: Bircher muesli is an original health food. Back before all the fad diets, it was developed by Swiss doctor Maximillion Bircher-Benner in the early 1900s as a healthy breakfast for his patients, who he kept on a diet heavy in raw fruits and vegetables; this was long before raw food was as trendy as it is now. 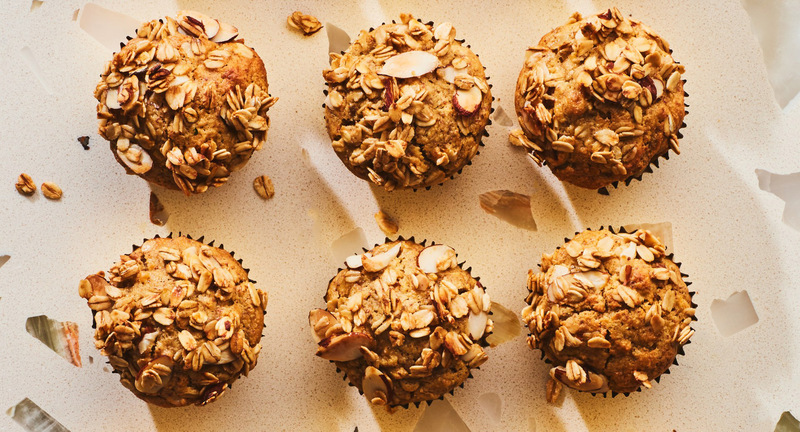 These muffins draw inspiration from that muesli and have all the same flavors—raw apples, rolled oats, sliced almonds, cinnamon, maple syrup—all cooked up into delicious muffin form. These muffins keep well in an airtight container for at least five days, so you can make them on the weekend and enjoy all week. They’ll be especially useful when your house is full of guests for Thanksgiving and you want something you can hand a hungry kid or relative (or yourself!). It’ll feel like a treat any time of day. Get the recipe here: Gluten-Free Apple and Oat Muffins (Muesli Muffins). Do you have any favorite fall recipes you’d like to share? Let us know in the comments below!